Fusion, "the rubber of the future"
Fusion is a new type of rubber with a sensational mix of synthetic and natural rubber. Fusion is the rubber of the future, designed for the modern era of table tennis and with extraordinary opportunities to create speed and spin. 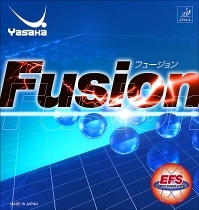 Fusion is a medium soft rubber with the highest quality grippy topsheet, developed by the japanese rubber technicians. When using glue, either speedglue or waterbased glue it has a great sound and a perfect mix of control, speed and spin.